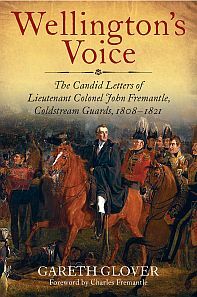 The letters of John Fremantle of the Coldstream Guards and aide de camp to the Duke of Wellington are of immense interest and of great historical significance. Hailing from the junior ranks of the nobility John Fremantle relied on influential friends and family to propel his career. By a number of lucky coincidences his Uncle William had made some very useful connections with men who then became very senior figures in the Army when his nephew joined nearly two decades later. The letters written by John to William whilst serving on the Staff of General Cradock in 1808 are revealing regarding that much maligned officer and the situation of the small Army of Portugal at that time. Those written when he served with the 1st Battalion the Coldstream Guards as adjutant for the next four years between 1809 and late 1812 are useful as another source of material on life as a subaltern Guards officer, particularly as he describes as an eyewitness the battles and sieges of Oporto, Talavera, Bussaco, Fuentes d’Onoro, Ciudad Rodrigo, Salamanca, Madrid and Burgos. However, the second half of the letters are of significantly greater importance; for John Fremantle finally joined Wellingtons family of Staff officers as an aide de camp and became firmly embroiled within the machinations of these young officers, all desperate to gain their commander’s eye. In his new role, John witnessed the Battle of Vitoria and was given the honour of carrying the despatch and trophies of war home to lay them before the Prince Regent; for which he gained immediate promotion within the army in the time honoured way. Soon returning to Spain, having missed the Battle of Sorauren and capture of San Sebastian; he was back in time to witness the advance into France including the crossing of the Bidassoa and the Battles of Nivelle, the Nive and Orthes. John carried home the despatch for the Battle of Orthes and as such missed the final battle of the war at Toulouse. However, he was present with the Duke of Wellington during the following peace negotiations at Paris and at the Congress of Vienna, where he was the Dukes right hand man. With war breaking out again, John accompanied Wellington to Brussels and fully participated in the Waterloo campaign, having a horse shot beneath him at the Battle of Quatre Bras, but he survived the campaign without a scratch. He then remained with the Duke’s headquarters throughout the period of the Army of Occupation in France. During this six years within Wellingtons family, John wrote candid letters to his uncle, constantly carping at his fellow Staff officers; describing in great detail the bitchiness, the back stabbing, the one-upmanship and the intriguing that went on; a far cry from the idyllic portrait of Wellington’s ‘family’ that has been pedalled for nearly two centuries. The foibles of the great man himself are not hidden; the duke’s philandering is now notorious but is confirmed in full; his irascible nature; his own petty intrigues and jealousies exposed. John himself was not without sin however, short tempered, quick to take offence and prone to ill considered outbursts, his own relationship with these individuals was turbulent and his constant carping over what he perceived as unfair treatment of others was undoubtedly wearing. He had many good friends but undoubtedly also encountered some who disliked him intensely. His opinions of other general officers are honest and consistent; Hill and Cradock receive ample praise but others, especially Clinton who he describes as ‘greatly disliked’ and Fermor who was apparently a ‘complete old woman’ receive less favourable reviews. John also writes much on the current political situation and future plans of campaign etc therefore giving a more rounded view of circumstances and the reasoning behind key decisions of the Duke. His letters written with immediacy and without the dreaded hindsight are therefore of great interest to both the military historian and those more inclined towards the social aspects of life in the upper echelons of the Army and particularly of high society in the early years of the nineteenth century.